I have been writing posts every single day for almost two years and I tell ya, I am running out of greetings. I need to start researching some new ones. I guess hello is as truthful and simple as it comes? Well on to today’s recipe. Do you like chocolate? Do you like bread? Do you not want to have a lot of calories? Do you have problems with family members eating vegetables? Well, if the answer is yes to any of these questions, then I have the bread for you. 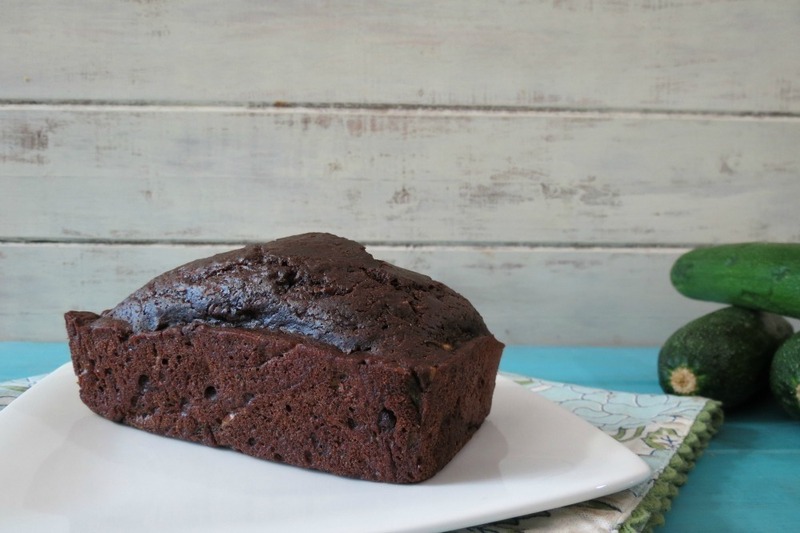 Here is my Lightened Up Chocolate Zucchini Bread. This bread is amazing! It’s moist chocolaty oh so darn delicious, plus it’s low on calories too!! I had a bundle of zucchini to use and I just had to make zucchini bread. This recipe is sure to please, plus it’s the only way I can get my Husband to eat zucchini. He used to like it, but now he won’t touch it. Why? No clue? It’s so good and so versatile. I simply love this little green vegetable. I thought I would share with you how I live my life in the kitchen on a daily basis. I have to say I am never alone. When I photograph pictures this is the scene on the floor. Notice my foot? It’s hard taking pictures and he won’t budge! That is my boy Sammie, with his sister next to him. I couldn’t get a full shot of her. It was kind of hard to take the picture. By the way, I am in need of a pedicure! 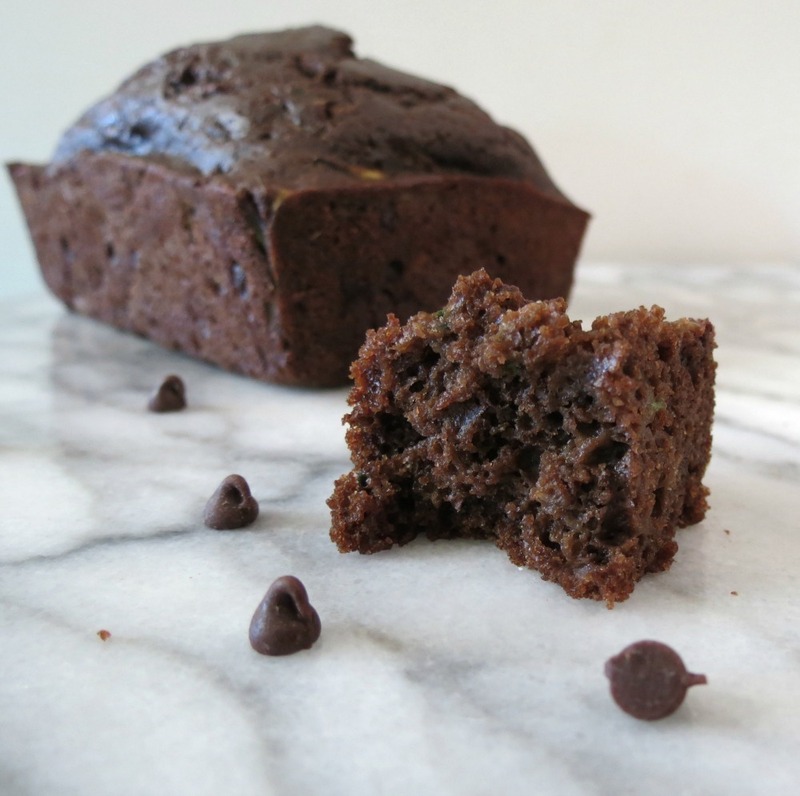 A rich, moist, chocolate bread filled with fresh zucchini and mini chocolate chips. In a bowl; add flour, cocoa powder, espresso powder,salt, baking soda, baking powder, mix until combined; set a side. In a bowl, whisk together egg whites, stevia, brown sugar, yogurt, coconut oil and vanilla extract. Mix until combined. Pour flour mixture into egg mixture, and carefully mix until incorporated, do not over mix. If batter is thick, add 2 tbsp. milk. Fold in zucchini and chocolate chips. Pour batter into prepared pan and bake in oven for 50 - 60 minutes for large loaf or 30 - 35 minutes for mini loafs (my mini's were 30 minutes). Test bread with a tooth pick. If the toothpick comes out clean, the bread is done. Well, I need to get ready. Little Jenny and I are heading to Menchies for some frozen yogurt. They have White Chocolate Raspberry and Devils Foodcake for only 45 calories a 1/2 cup. Talk about guilt-free, plus no sugar or fat. I don’t want to know what is in it, but all I know is I love it and can’t wait to get my hands on some! Yummy!!!!!! P.S. Please vote for my Peanut Butter and Jelly Tart. No registration required! You can vote everyday and have a chance to win up to $2000 in prizes. Thank you for your help and support. Just go here. Enjoy your froyo, and don’t worry about whats in it 🙂 my mom is a certified nutritionist/scientist and gladly indulges in it every so often 🙂 Love the idea of adding zucchini! I had a really interesting cake the other day and this recipe looks quite similar, can’t wait to try it. Could you maybe suggest an alternative for the whole wheat? Would oat flour work? Love your blog! Hi, I am not sure if oat flour would work, I think it maybe to heavy? But you may want to give it a try to see? I would probably suggest rice flour or all purpose flour instead? Thank you for the nice comment! Have a great Friday and a super lovely weekend!! oh wow this bread looks so good! Thanks Katie! 🙂 Going to check your site our, Strawberry Pineapple Milkshake! Yum! Looks delicious! Looking forward to trying it! 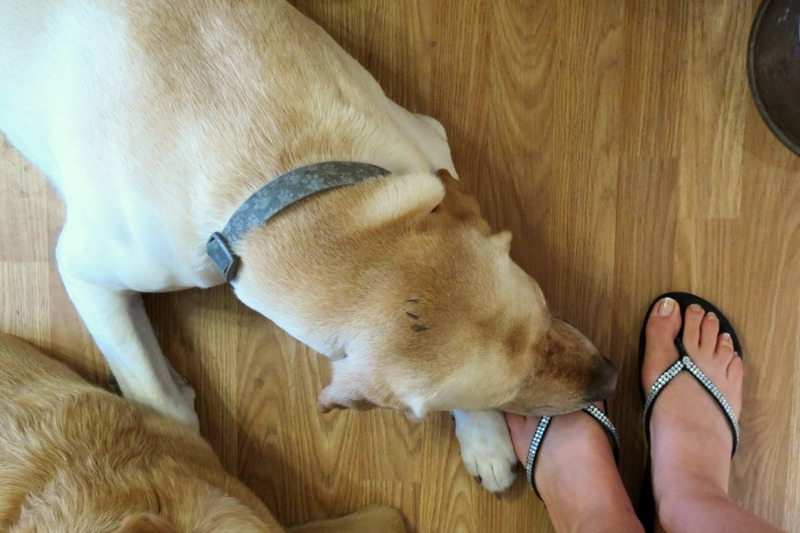 I love the photograph of your dogs providing moral support!!! Thanks Natalie! Love your name, it’s the same as my sister! 🙂 Lol about my dogs they are always hanging around in the kitchen, hmmm I wonder why? Thank you so much, I love zucchini bread and cant wait to try this new version! Your welcome Deanna! Have a super great weekend! I love chocolate in baked goods too! Congrats on the new food processor! Have fun with it!!! Can’t wait to see what you make! 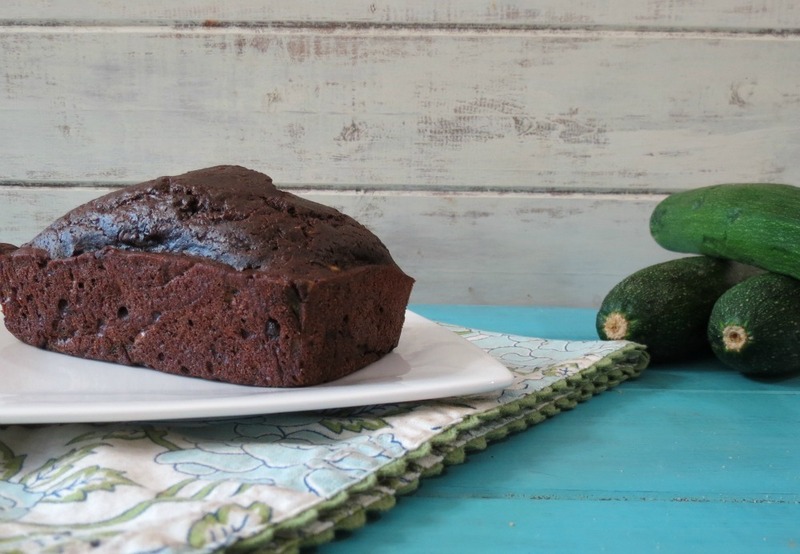 I love zucchini and chocolate and this looks soooo moist! AMAZING work as always! This is gorgeous!! It looks SO moist and delicious!! Thank you Marie! 🙂 Have a nice weekend! One of the only ways I like zucchini. I can’t wait to try this! My grandma used to make a killer chocolate zucchini cake and this totally reminds me of it! So good! Grandmas make the best desserts! My grandma made the best cinnamon rolls! Oh how I miss them! Dogs and there dirt! I swear we can give them enough baths! 🙂 You do have to love them! 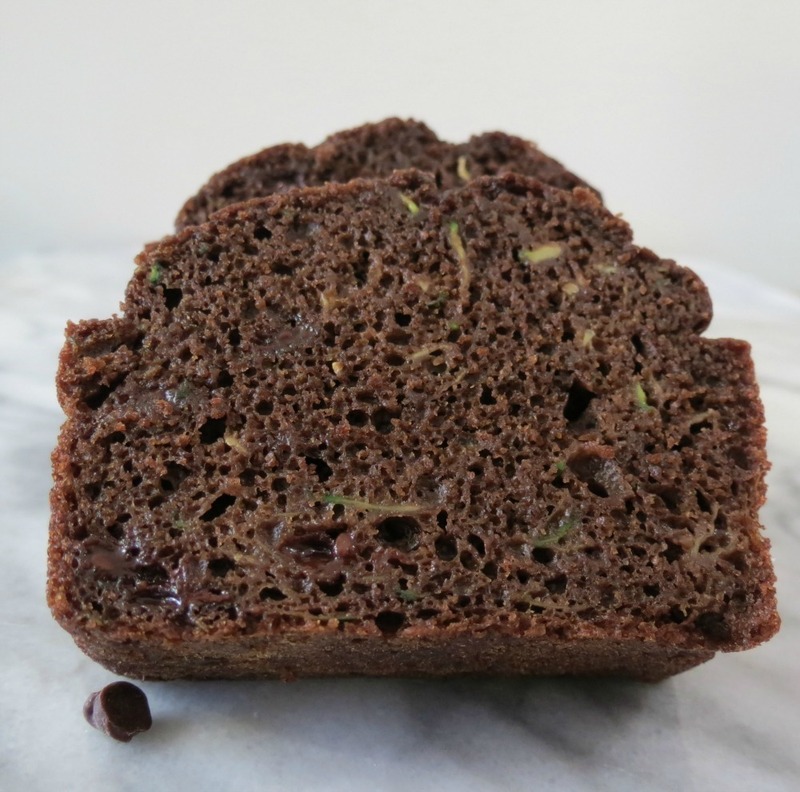 I love zucchini bread but have never had chocolate zucchini bread, I am intrigued. One really moist and beautiful zucchini loaf. I’m sorry but what on earth is egg substitute? Well, egg substitute products such as Egg Beaters brand, contain 99 percent egg whites. The other one percent comprises undefined “natural flavor,” coloring, spices, salt, onion powder, xanthan gum and guar gum. Many nutrients are added to make up for the ones lost from the yolk, so egg substitute will usually contain varying amounts of iron, zinc, folate, thiamin, riboflavin, vitamins A, E, B6 and B12, and have an equivalent amount of protein as whole eggs. While some brands, like Egg Beaters, contain no fat or cholesterol, others use vegetable oil as an ingredient, which adds to the fat content again—though the fat is largely unsaturated. My husband just made zucchini bread and he has more to make so I’ll pass along the recipe. I’m not a huge fan of zucchini. I am preparing to make this bread and am wondering how much is in 1 Stevia packet? I have a large bag of it. One packet of stevia is 1/2 tsp. Hope you like it. Let me know how it turns out for you. Turned out great! Instead of 1 loaf, I made 2 smaller and they are already gone! Thanks for sharing! Yah! I am so glad it turned out! Thank you so much for telling me! I do love this bread and happen to have more zucchini! !